The astrological sign Virgo is represented by the birthstone carnelian. I made this anklet (sometimes called a slave bracelet) to celebrate Virgo ladies and their birthstone. 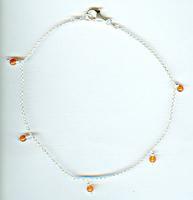 In this anklet tawny orange carnelian 4mm beads dangle from sterling silver chain that's fine as a baby's breath: barely 1-1/2mm thick. 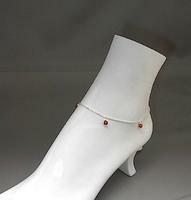 I've added a sterling silver lobster claw and loop to make an anklet about 11-1/2" long. I'll happily make a birthstone anklet that's longer or shorter to a buyer's specifications. IMPORTANT NOTE TO THOSE NOT OF THE VIRGO PERSUASION: Sparkle Plenty enforces a strict policy of not discriminating against the astrologically challenged. 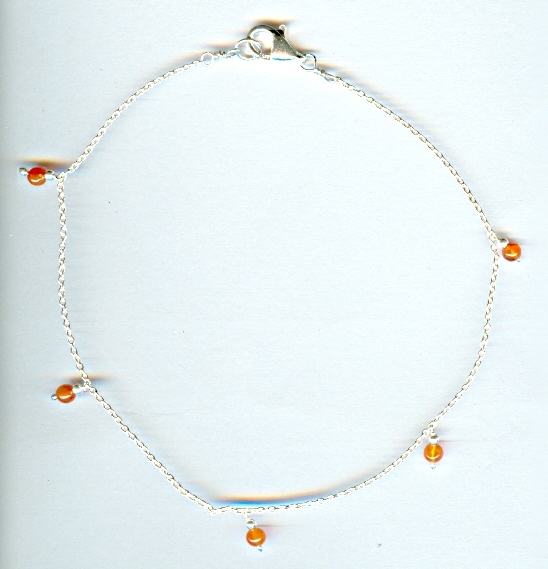 Those whose birthstone is NOT the carnelian are still eligible to purchase this anklet. At SPARKLE PLENTY we love to give our customers EXACTLY what they want. This charming little cross pendant is a bit less than 1-1/8 inch long (not counting the bail and loop).